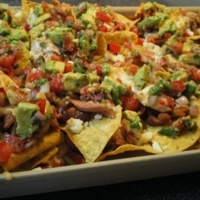 Amazing fully loaded chicken nachos real authentic goodness great for parties. Who doesn't love real great nacho goodness ??? I love nachos and dips. Learning different varities are awesome. Looks really tasty...will be making this for myself.